Well-researched, masterfully crafted blogs are critical components of your website. Not only are blogs crucial to effectively communicating your company’s message and services to the public, but they are paramount to your site’s discovery and ranking within search engines. Also of vital importance is that the content is original. Morey Creative prides itself on creating smart, relevant, unique content and utilizing the latest, most effective search engine optimization (SEO) strategies to ensure your site rises above the din, is easily discoverable, accessible, and attractive, while successfully conveying exactly what you want: your services, your products, and your message. Understanding The Buyer’s Journey helps formulate and target your content to be as effective as possible. Communicating with prospective clients along the various stages results in more relevant solutions, along with the capability of guiding them to the finish line, no matter how, where, or when they discovered you. Prospect is experiencing a challenge and is doing research to more clearly understand it. Prospect is researching solutions to their problem and compiling options. Prospect is comparing solutions to their problem and looking to commit resources. One of the best aspects of blogging is its role in social media. Sharing original content helps improve the value of your social presence, provides fodder when you may feel maintaining an active presence it is a struggle, and it helps generate additional traffic back to your site. Exceptional content demonstrates authority within your vertical. This builds trust and creates connections. And because that content holds value, visitors are willing to pay for it, with personal contact information, such as emails. This data can be responsibly and respectfully used to assist these visitors as they move through The Buyer’s Journey. Common Content Offerings include eBooks and guides. These short, digital publications are easily digestible and can accompany other content as a Learn More offer. These oftentimes consist of Tips, Myths, Checklists and/or Case Studies. 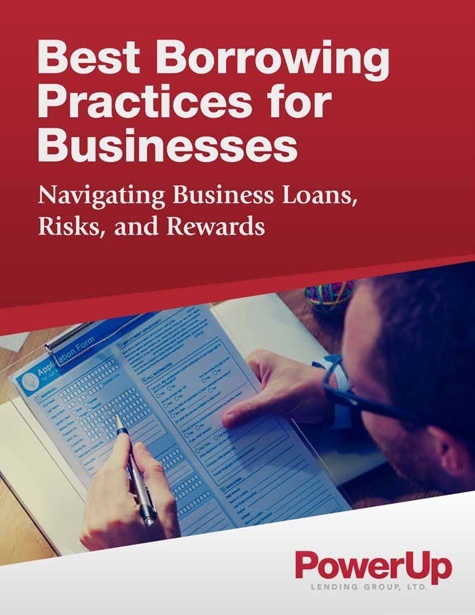 Morey Publishing produced this eBook for PowerUp Lending Group—a direct small businesses lender—as a Content Offering to help explain the borrowing process to prospective customers. Request an exploratory review today to find out how to take your business to the next level.